Normally I’m not a big fan of leaning at the tape. It’s not so much because I don’t think it can be effective. I know it can. 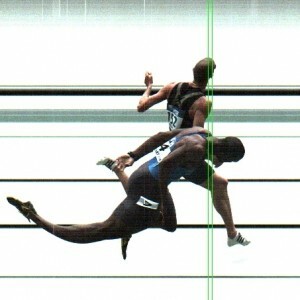 In fact, the best outcome I ever had in a high school race was due to a dramatic (at least to me) lean at the finish. As a coach though, I’ve seen mistimed leans do more harm than good. Part of the problem is that when a lean is most needed (in a close race and presumably under fatigue), is the time when a lean is most difficult to execute. The mechanics of a good lean require a significant deviation in appropriate sprinting mechanics. This in turn causes a rapid deceleration that is nearly impossible to recover from. As a result, it’s of utmost importance that the lean be timed to occur at the finish line and not a step (or two) before it. If you want to see how to execute a good lean, check out LaShawn Merritt’s recent photo finish lean at the line to beat back rival Jeremy Wariner by 0.01 seconds in the 400m at the World Athletic Final. To put it in to context, it will also be beneficial to watch the race (especially the final 50m) that preceded it to see just how perfectly the lean was executed.